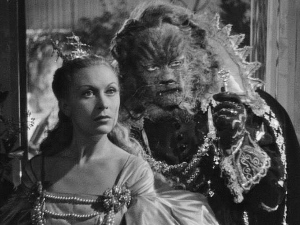 Jean Cocteau’s Beauty and the Beast is ripe with indelible images of pure fantasy. That it was achieved with a modest budget in post-war France makes it even more impressive. The sets are exquisite — you’ll find them echoed in Ridley Scott’s Legend and Tim Burton’s Edward Scissorhands. I especially love the human arms that hold the candelabras out from the castle walls. Very simple, but magical. Jean Marais gives the strongest performance — two of them actually, as he plays both The Beast and the antagonist Avenant. Between the two roles, he covers the gamut of masculine expression: the raw and the refined, the passionate and the retrained. Josette Day can’t quite measure up to him. The movie is at its best while Belle and The Beast are getting to know one another. The final act drags just a tad, and the ending is somewhat abrupt, but the movie’s childlike sense of wonder remains intact.